Spot on. A lot of Brits are a bit perplexed by his appearance and mannerisms. His tie is weird - much too long. He also has a very rat like mouth. The way he repeats phrases is a bit grating too. The orange thing and the hair (the hair!) We feel a bit sorry for his wife. Brits don't tend to take much of an interest in US politics though, unless it affects us. Strangely its the tie thing I find most unsettling. The rest is just what I would expect of a reality TV star but the tie thing is just weird. Has no one ever told him? Does he genuinely think looks better that way? Does Melania tie it for him as some elaborate coded cry for help? Forget his position on the deficit or if he really does want to build a wall. These are the questions that must be answered! Yes, the tie is weird. I wonder if anyone has dared to tell him? If they have, he obviously took no notice. Either way, it says a lot about the man. The hair, the same. As a man rapidly approaching the age when hair styles become less about looking good and more about coverage I will cut him some slack on his hair. However his tie budget is more than my mortgage. Learning to dress like a gentleman should not be that difficult for him. Maybe they double as a handy restraint if Melania tries to make a break for freedom. The concept of an American attempting to dress like a "gentleman" amuses me greatly. As for the hair, there is coverage and then there is Trump's hair. Do you think he puts a bowl of milk down for it at night? It is perfectly possible for an American to dress like a gentleman. They just need to work hard at being more British. I can't imagine Trump doing anything for any other living thing. Still Melania might in the hope that it one day turns against him. I don't care for him much, he has a personality disorder(covers a lot of things), definitely think he loaded up his cabinet with..essentially swamp creatures..just his swamp creatures. Oil barons in charge of a gutted EPA, huge donors in charge of other things..DeVos as an example..pay to play is not draining any swamps. He has done things I think are ok/needed, but at time's diminishes the positive with waaay over the top rhetoric. 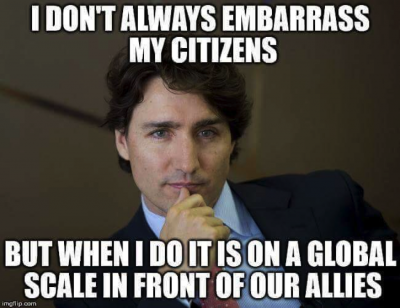 I don't like Trudeau..at all, but at least he put it on SA at the G20.